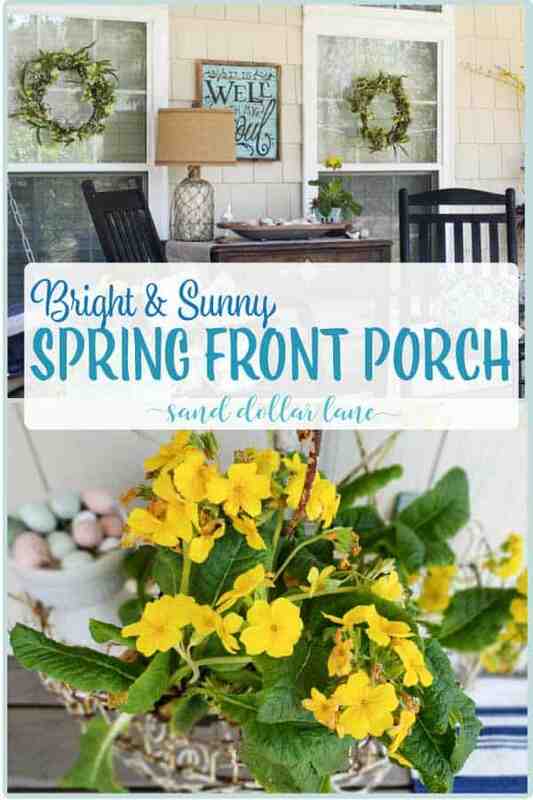 Spring is finally here and I have some bright and sunny Spring Porch Decorating ideas to share with you! 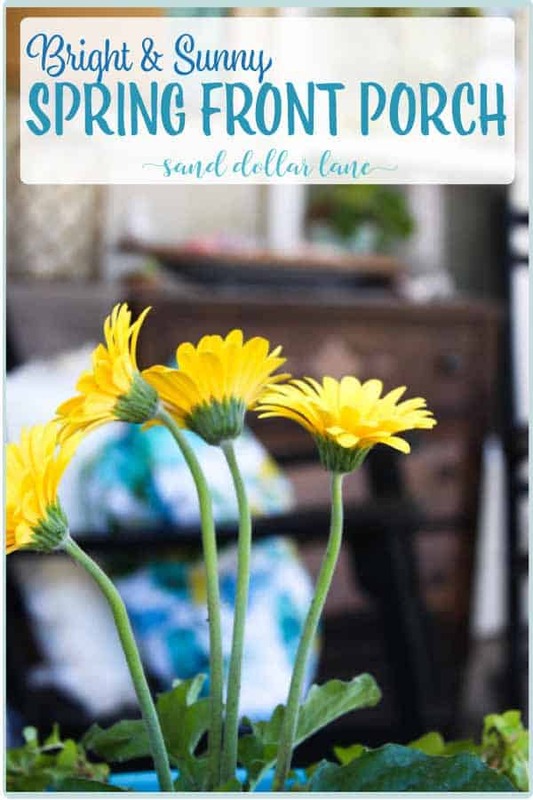 It may be because winter seemed soooo long but this spring I am decorating with bright sunny colors, yellow, turquoise, green and blue instead of the pretty pastels I used last year. 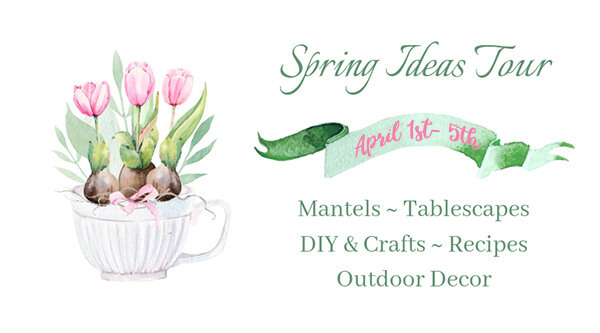 If you have been following my Instagram stories, you already know that I am joining a great group of bloggers for the Spring Ideas Tour. Every day this week there was a different theme and all of the ideas have been amazing! Today’s theme is Porches and Decks. 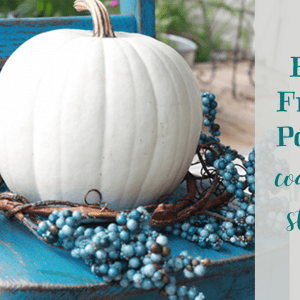 Be sure to check out all the other bloggers at the end of this post to see if you missed any this week! A huge thank you to Angie from Postcards from the Ridge for hosting! Our last frost date is March 31st but I usually start shopping for flowers around the first week of March. What can I say, I am impatient when it comes to springs arrival! This year, it’s been so cold that I have only gotten a few plants so far. Don’t worry, I will stock up! 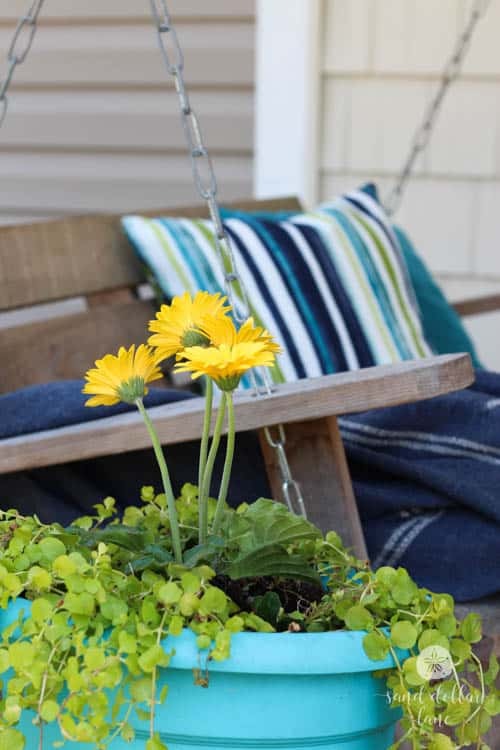 I did pick up these bright yellow gerber daisies and some creeping jenny. 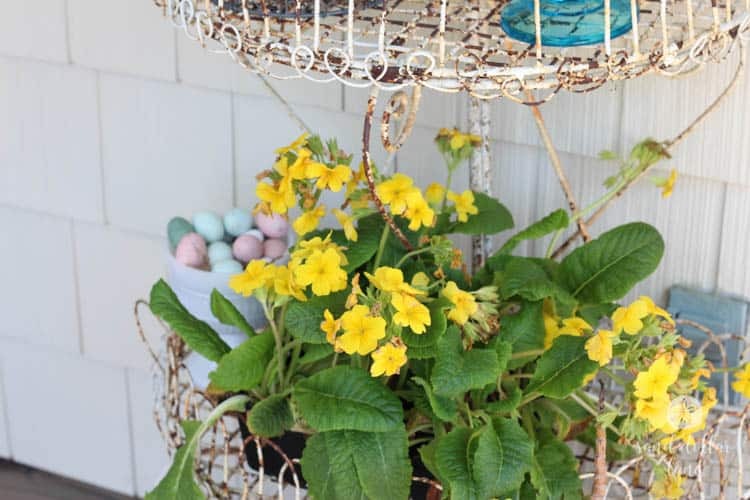 I also picked up a flat of primroses and sweet potato vines in the same colors. The bright yellow and lime green look so pretty together! Almost all of the plants that I have already bought will eventually be moved from the pots to the landscaping. I may need to dig a new garden bed because I am running out of space! 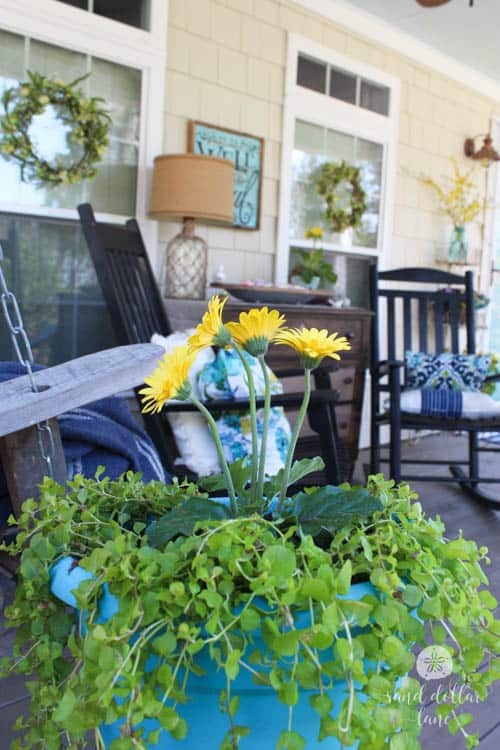 Then the pots on the porch will have summer flowers in them, like petunias, diamond frost and verbena. 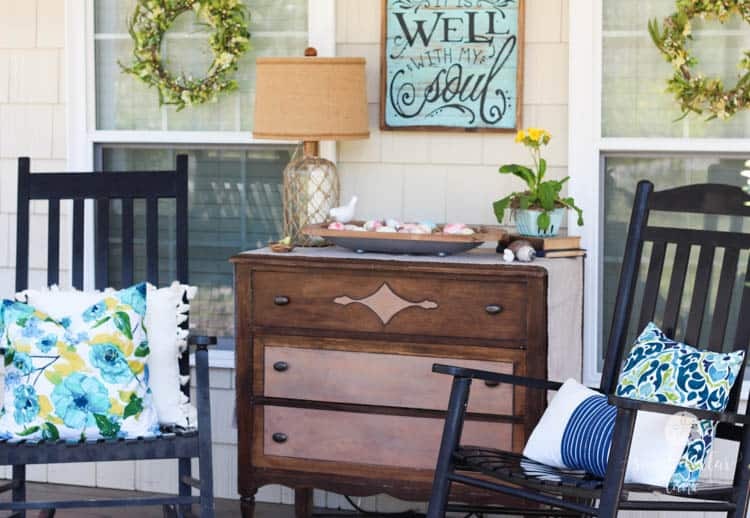 JC and I recently refinished this cute dresser and put it on the front porch. We figured we spend as much time out on the porch (I am actually writing this from the swing!) as we do any room in the house so it may as well look like a room! I will be sharing more about the dresser rehab soon, you aren’t going to believe what we did to it! I brought out this fun coastal lamp that you may remember from our summer home tour and our fall dining room (this lamp gets around!) and a dough bowl full of Easter eggs. 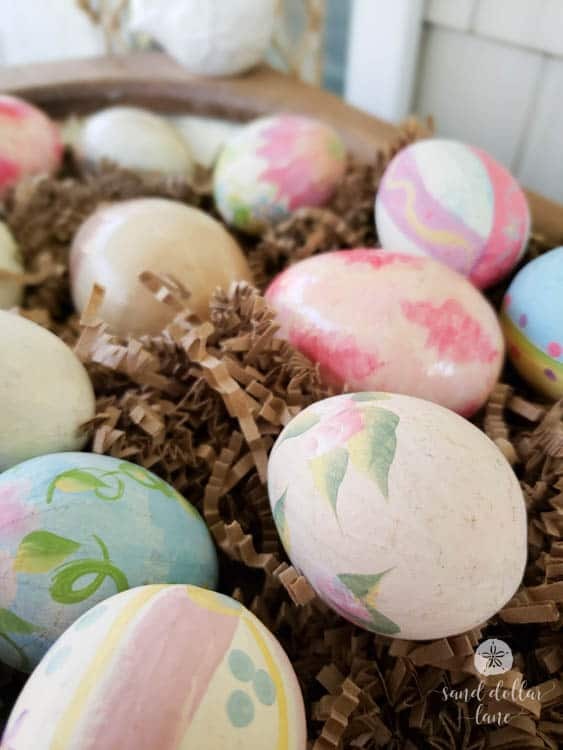 The eggs are our rock egg collection and some paper mache eggs that I painted years ago. A primrose in a berry dish and a couple little ceramic birds were the final touch. I have had these spring wreaths for a few years. Sometimes they go on the french doors in the dining room but this year I thought they would be cute on our front windows. The only other time I have ever put wreaths on the windows in Christmas. 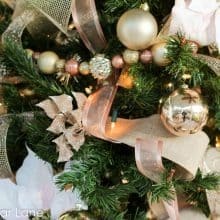 Do you put wreaths on your windows? I wasn’t too sure about it at first but now I think they’re adorable. You all, I did not need any more pillows in my world! I had planned on using ones I already had (there’s a large selection to choose from in my storage room!) but I couldn’t resist these bright colorful ones from Lowes. The striped one has a flower pattern on the back so it’s like getting two pillows for the price of one (at least that’s how I justified it to myself). 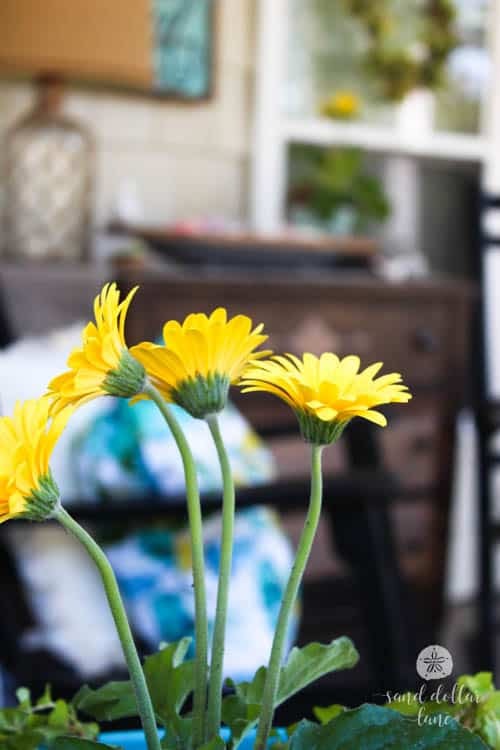 I hope you liked our bright and colorful spring porch decorating. 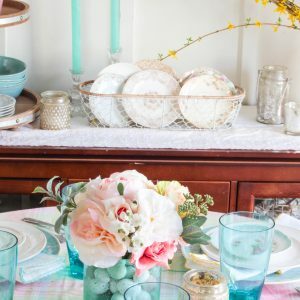 Tell me, what colors are you decorating with this spring? 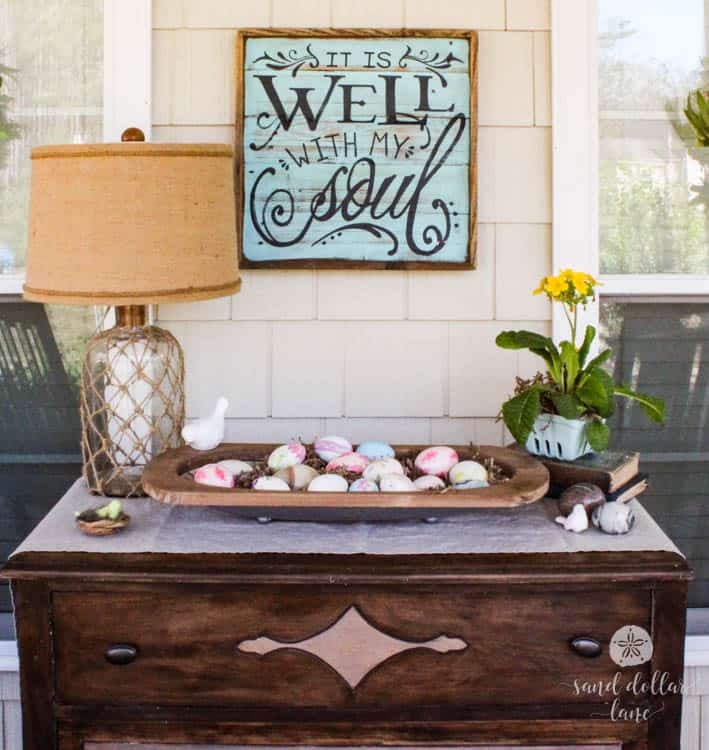 Be sure to check out the posts below for more spring decorating ideas! 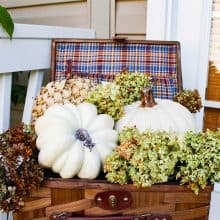 Your porch looks so pretty and inviting. I love the addition of the dresser and wreaths on your windows. I’m itching to buy some plants and seeing your planters filled with flowers makes me want to get some this weekend. 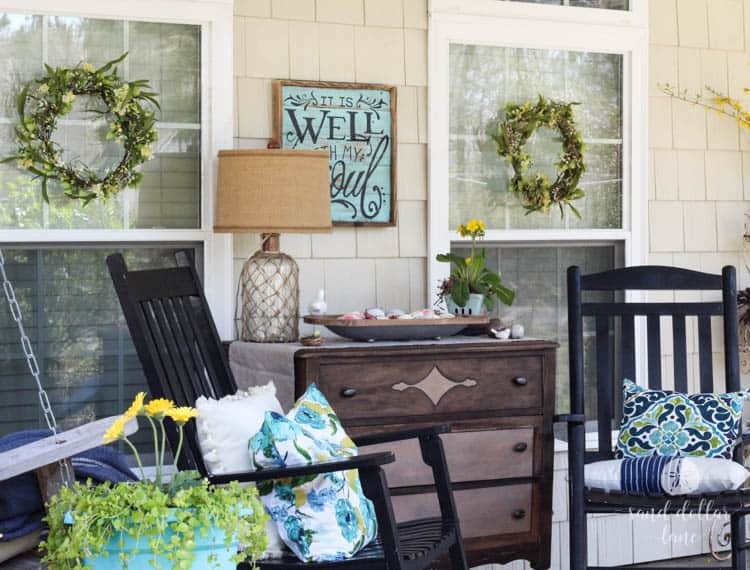 Enjoy spring days on your pretty porch! Thanks Paula! Just seeing plants puts me in a spring mood! 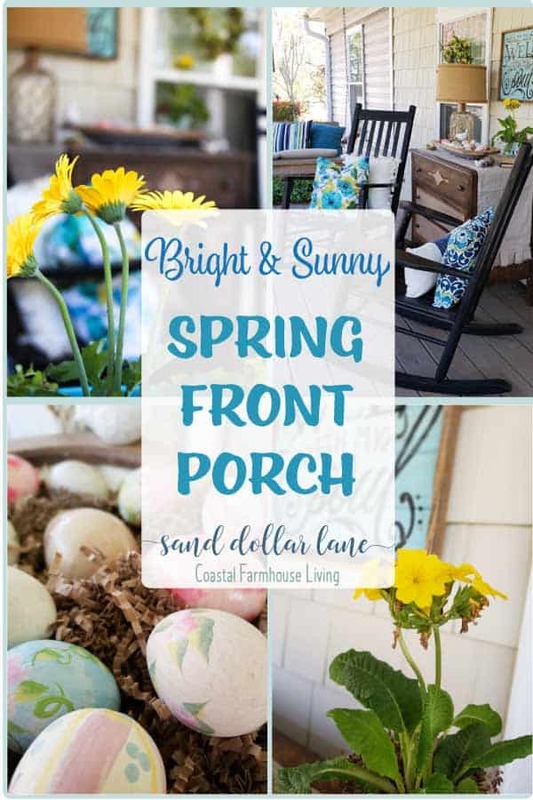 You porch is so bright and sunny…surely spring can take a hint!!! 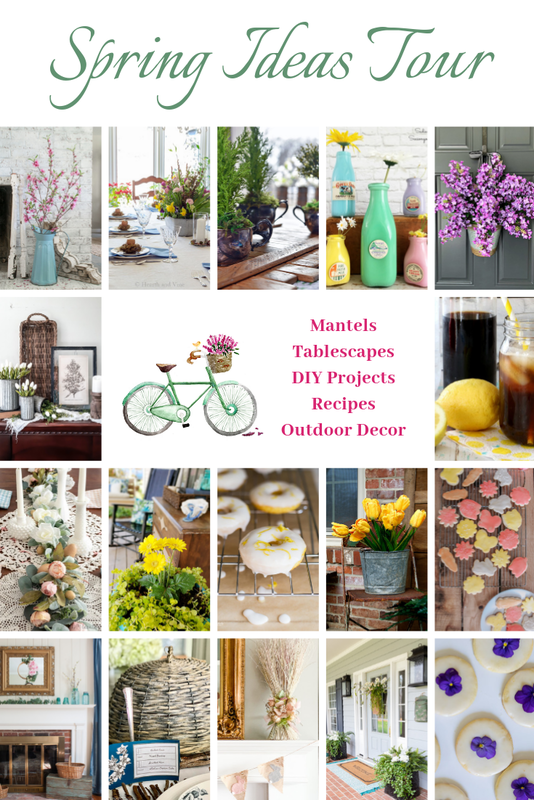 I need to get busy and get my home ready for spring…since I’m sure its coming…sometime!!! Yes, it has to arrive eventually!! It seemed more like spring after Florence! So beautiful! l love all the yellow mixed in with blue. 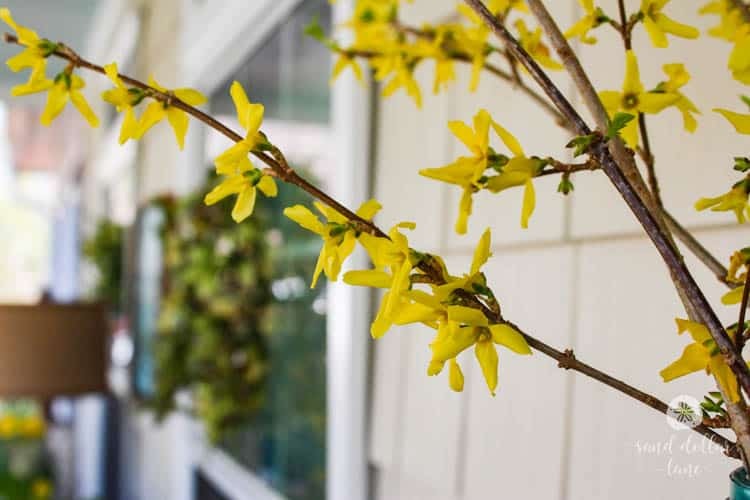 Primroses are a top favorite of mine and I always know spring is here when the forsythia bloom. 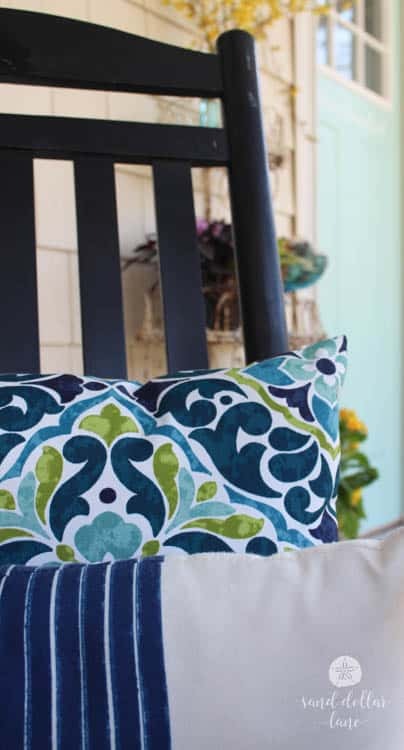 I love all the blue tones on your porch pillows!